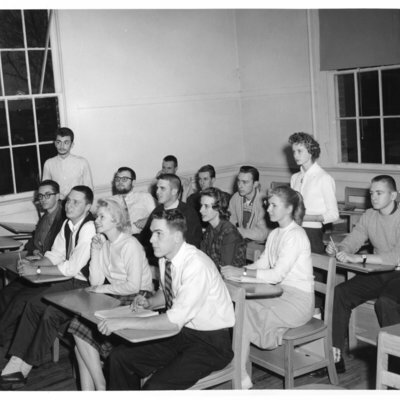 Photograph of a classroom at the Bailey's Crossroads Campus of George Mason College, ca. 1963. 8" x 10" print; black and white. 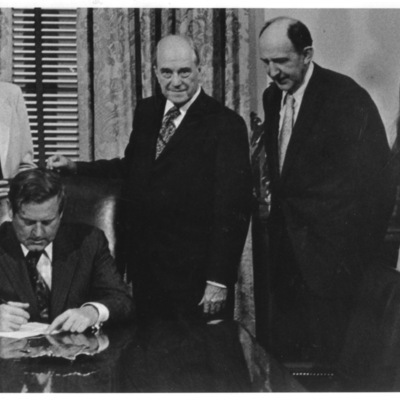 Legislation establishing George Mason University as an independent institution, separate from the University of Virginia, April 1972. This is taken from Virginia Acts of Assembly, Volume 1, Regular Session, Chapter 550. Three pages. Bid tabulation for George Mason College, Stage I construction, July 11, 1963. 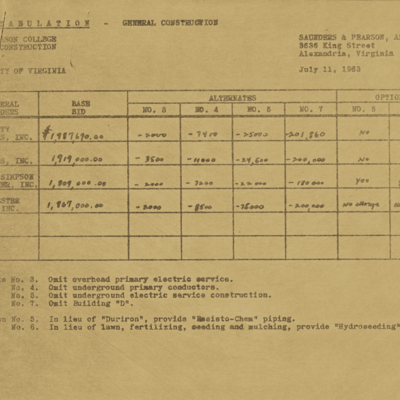 Mimeograph of listing of construction firms and their final bids for construction of Stage I of George Mason College, July 11, 1963. Laboratory, George Mason College, Bailey's Crossroads campus, 1963. 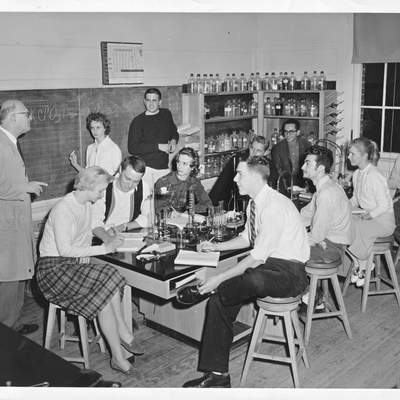 Photograph of students and instructor (Professor of Chemistry, Hyman Feinstein) in the laboratory at Bailey's Crossroads campus of George Mason College, 1963. 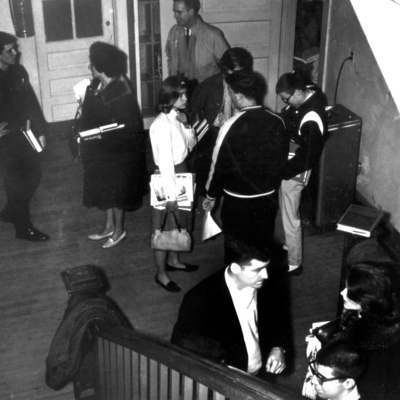 Spanish class getting out, main hallway, 1963. Photograph taken by Richard M. Sparks of students in the front foyer of Bailey's Crossroads campus of George Mason College, 1963. 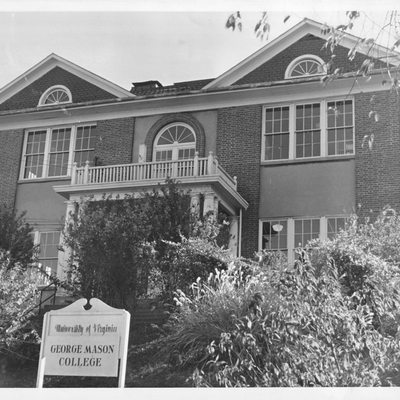 Photograph of the original George Mason College building from the north facing Columbia Pike (Route 244). This building had eight rooms. Note the modified sign, which previously read: University of Virginia University College. J.N.G. Finley to Mr. W.L. Murray, July 26, 1962. 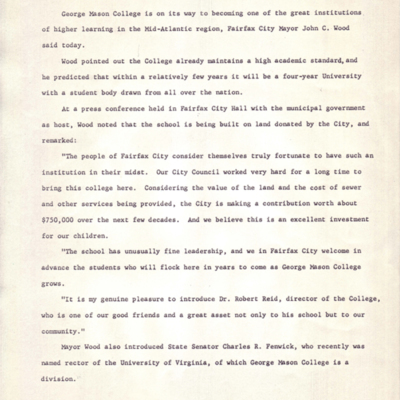 Carbon copy of humorous letter written by George Mason College Director J.N.G. 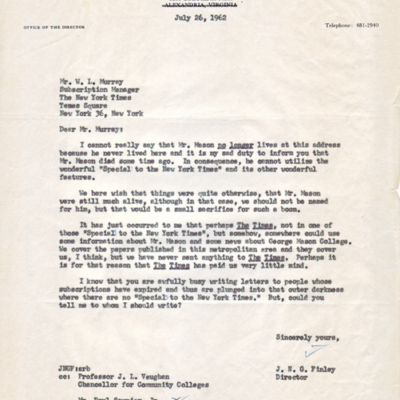 Finley on July 26, 1962 to the subscription office manager for The New York Times, Mr. W.L. Murray, in response to a promotion sent to "Mr. George Mason". 1 page.